Odaiba, the futuristic shopping and entertainment island in Tokyo, is a techie wonderland. Besides your standard fare (Ferris wheel, shopping mall, Lady Liberty replica), it sports a full-scale Unicorn Gundam statue, a Toyota theme park, and a museum of Emerging Science and Innovation. 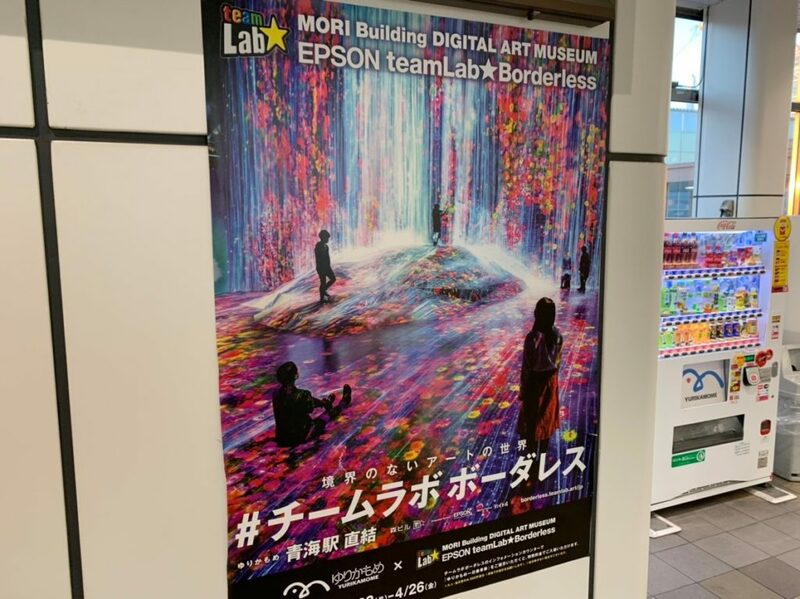 And since last year, there’s also a permanent museum with a particularly unwieldy name: the Mori Building Digital Art Museum Epson teamLab Borderless. The interactive digital art museum is made up of a 10,000 square meters maze, on two levels. It features fifty artworks orchestrated by a network of 520 computers and 470 high-tech projectors, creating visual and interactive artworks on the walls that move in and out of rooms. It’s a hypnotic cacophony of lights, color, and soothing new-age sounds, of swirling flowers, slo-mo waterfalls and psychedelic animal spirits passing by. There ought to be a word for the sense of loss when trying to capture grandiosity in pictures. The feeling when that mountain range, gorge or cityscape you tried to capture becomes flat and stale when viewed in a picture frame, devoid of its original splendor. Perhaps this is also why we prefer to turn the camera around to face ourselves these days, creating a stylised still that often seems better, more effective, than the original. 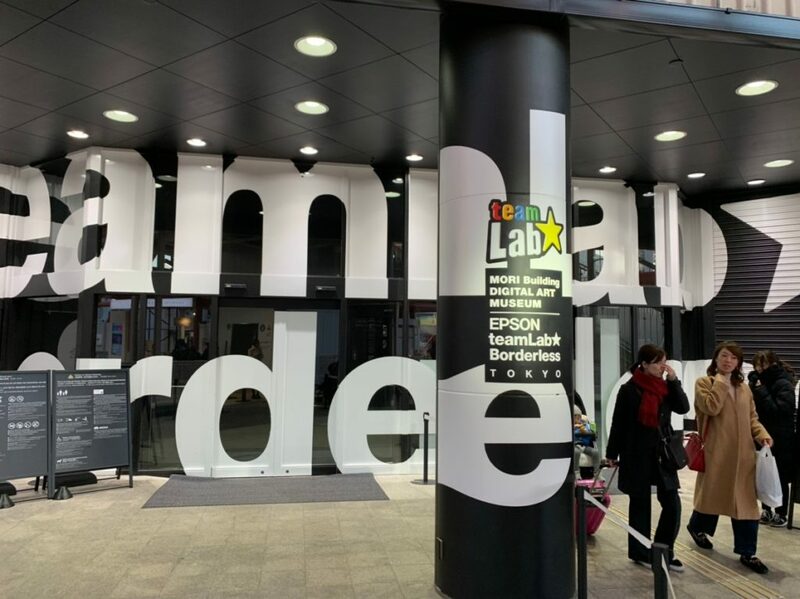 The obvious – question if the teamLab Borderless exhibit can be considered “art” – must be answered with an obvious yes. This is mainly because it brings out the essence of the selfie culture we are living in. The most striking aspect of the experience isn’t its technically breathtaking visuals but the people. Yes, it’s interactive, but the most frequent interaction is that of people taking pictures of these images, a meta-spectacle Baudrillard would have been able to write seven books about. It is not just the influencers and the models, here, who seem spontaneously seized by a bout of self-obsession. The bankers, the hippies, the shy girls, the middle-aged men, all of them are lurking around, hunting for the perfect spot, the perfect moment, shortly frozen for the snapshot and then critically glancing at their screens to compare their picture to the previous one. It’s a musical chairs of practiced smiles and glamorous gestures, and of no small pressure: this is the perfect spot for a perfect picture. But despite the urgency, this place is also remarkably quiet. Several rooms are littered with couches and bean bags. There is a communal atmosphere, with people lying around in small groups, comparing their efforts and discussing what to upload. This is anthropological art, an incomprehensible paradox of high-profile self-branding practices and overt, genuine relaxation, supported by the low-key ambient soundscape. Perhaps tellingly, the exhibit also features lots of “infinity spaces”: rooms with mirrors on all ends that produce perpetual expanses. There are rice fields, forests, and crystal caverns, each one more perfectly suited than the previous for a selfie that seems unstuck from time or reality. But they are not, of course. The “Forest of Resonating Lamps” for instance has transparent walls when looked at from the outside. There is a long snaking line of people who can see into the forest, entertained by the small groups of guests who are permitted entrance every few minutes, who wander about and take their pictures before being led out by the personnel. Once inside, though, the walls are mirrors, and you immediately forget being part of the outside world that’s looking in. You seem alone in this vastitude, a brief moment of solace, and you have ninety seconds to make it count. In the end, the innovation of this experiment lies in its disinterest in the representational power of art. Remarkably, the explanatory plaques accompanying the artworks mainly focus on their technical aspects: the algorithm behind the magic. The “art” in this artwork is left to those wandering through these accomplishments. If this place could be considered a museum, as its name suggests, it is about curating the self. 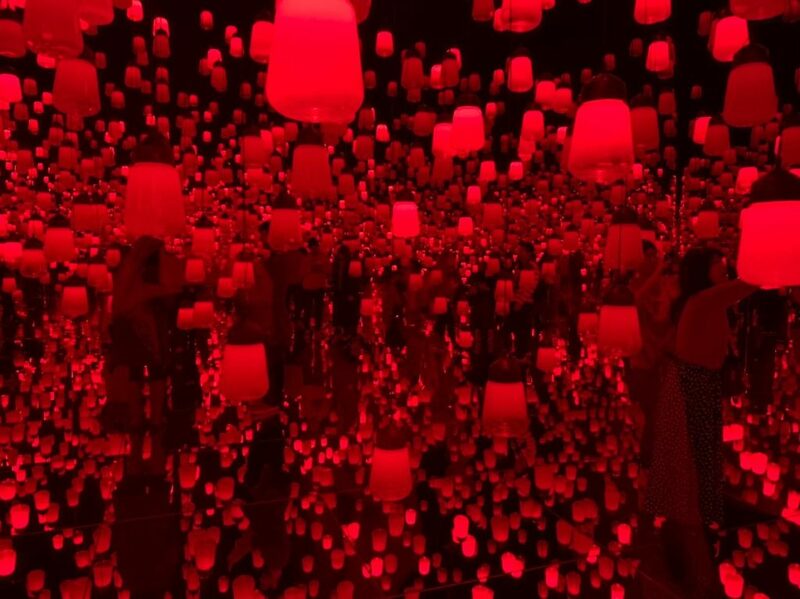 TeamLab founder Toshiyuki Inoko told the Telegraph: “We want visitors to get lost rather than follow the order.” Indeed, there are few places where we seem to be getting so actively lost in our own self-image.